We were sent this in by one of our readers, a Mr Andy Field. He has a wonderful trike, that has been winning shows all over the place for its engineering. 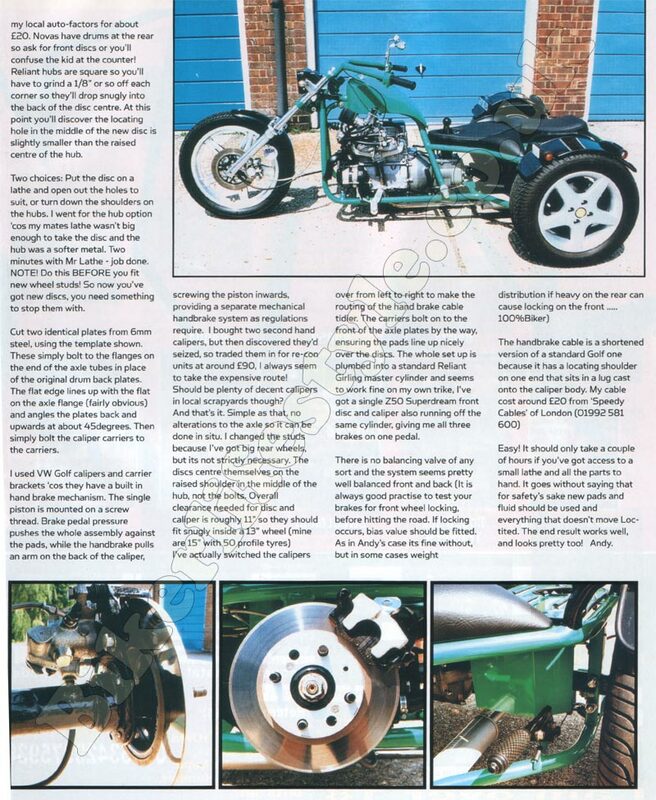 He reckons the most common question he gets asked about the trike is on the rear disc brakes. So he decided to share his info with you lot. Here it is then. First strip the entire Reliant drum assembly, place the parts carefully in a plastic bag – then chuck it in the bin! To remove the back plate (the bit the shoes attach to] from the flange on the end of the axle tube, you’ll need to either pull the hub off the drive shaft, or simply pull the whole shaft out of the tube. It locates into the diff on splines and just taps back into place with a rubber mallet when you’re finished. Just rotate the shaft till you feel the splines line up. my local auto-factors for about £ 20. Novas have drums at the rear so ask for front discs or you’ll confuse the kid at the counter! Reliant hubs are square so you’ll have to grind a 1/8″ or so off each corner so they’ll drop snugly into the back of the disc centre. At this point you’ll discover the locating hole in the middle of the new disc is slightly smaller than the raised centre of the hub. Two choices: Put the disc on a lathe and open out the holes to suit, or turn down the shoulders on the hubs. I went for the hub option ‘cos my mates lathe wasn’t big enough to take the disc and the hub was a softer metal. Two minutes with Mr Lathe – job done. NOTE! Do this BEFORE you fit new wheel studs! So now you’ve got new discs, you need something to stop them with. Cut two identical plates from 6mm steel, using the template shown. These simply bolt to the flanges on the end of the axle tubes in place of the original drum back plates. The flat edge lines up with the flat on the axle flange (fairly obvious] and angles the plates back and upwards at about 45degrees. Then simply bolt the calliper carriers to the carriers. over from left to right to make the routing of the hand brake cable tidier. The carriers bolt on to the front of the axle plates by the way, ensuring the pads line up nicely over the discs. 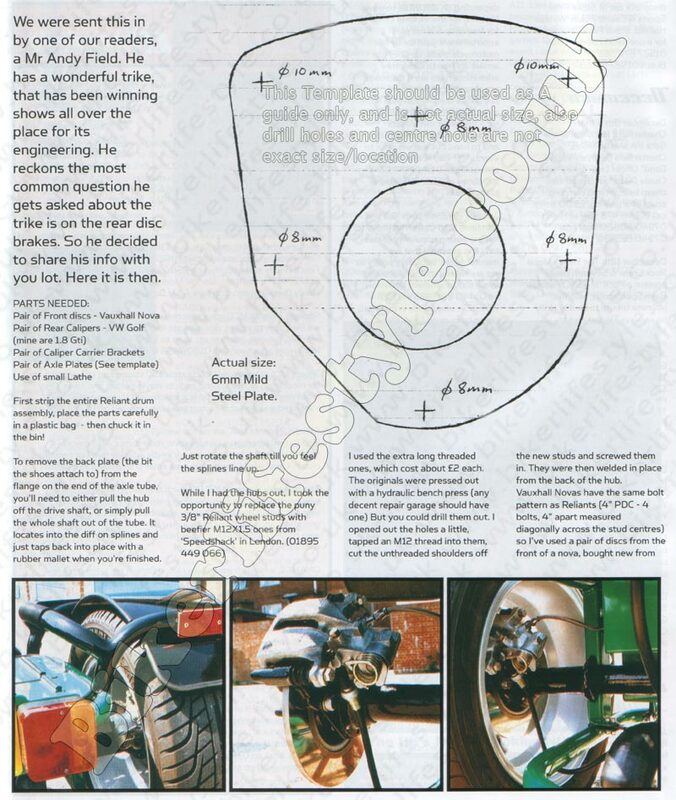 The whole set up is plumbed into a standard Reliant Girling master cylinder and seems to work fine on my own trike, I’ve got a single Z50 Superdream front disc and calliper also running off the same cylinder, giving me all three brakes on one pedal. There is no balancing valve of any sort and the system seems pretty well balanced front and back (It is always good practise to test your brakes for front wheel locking, before hitting the road. If locking occurs, bias value should be fitted. As in Andy’s case its fine without, but in some cases weight distribution if heavy on the rear can cause locking on the front ..
Easy! It should only take a couple of hours if you’ve got access to a small lathe and all the parts to hand. It goes without saying that for safety’s sake new pads and fluid should be used and everything that doesn’t move Loc-tited. The end result works well, and looks pretty too!